So what might Digital Sustainability be? There is a group of Swiss parliamentarians who are organized in a group for “Digital Sustainability” for which I’ve been asked to participate as part of an expert group that consists of practitioners in a variety of fields, including Free Software and Open Standards. But while German Wikipedia at least has an article about Digital Sustainability, most people simply seem to apply the “I know it when I see it” test, which is somewhat less than satisfactory. What can be said is that most people intuitively seem to agree that Digital Sustainability would include aspects such as Free Software, Open Standards, Open Governmental Data, Privacy and a couple of other aspects. But how to define or describe it in a simple and transferable way? Self-Determination: You define your own privacy, including for your digital environment, and determine how much of your information you are providing, and to whom. In order for something to be digitally sustainable, none of the above three principles may be violated. Another way to think about it might be to see self-determination as the natural limitation towards how transparent your person should be to others and how much they should participate in your life, based on a principle of reciprocity since this is valid for every individual in society. The agglomeration of all of this then forms a consensus within and throughout society as to what things shall be governed jointly, and with equal participation of all. So all three aspects need some form of balance, as your right to request influence is linked to the limits you set for your own self-determination. But pushing the limits of your own self-determination eventually causes friction once it comes in conflict with the self-determination of another person. 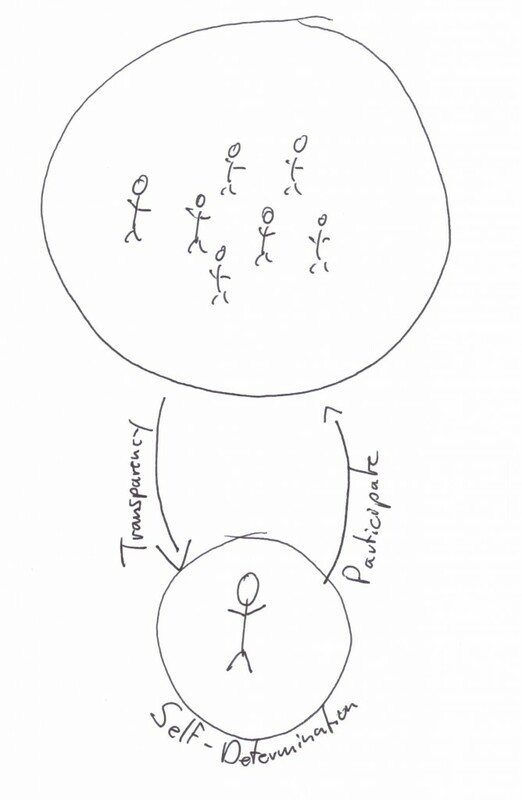 That is when transparency and participation need to help to find a workable balance. Naturally this still represents work in progress, so I am not sure it is the answer to all questions in this area. But it seems to meet some of the criteria that I’d set for such a conceptual definition. Most importantly it is simple, understandable without technical knowledge, and allows to check existing services or situations for violation of these principles, and the result comes out at the right side of what I’d consider digitally sustainable. So for me, this seems workable for the moment. And if you like it, the next time someone asks you what is Digital Sustainability, you can draw them a picture. This entry was posted in Political Commentary and tagged Articles, Free Software, Open Standards, Politics. Bookmark the permalink. 5 Responses to So what might Digital Sustainability be? It’s a nice succinct wrapping up of the expectations of the individual (and, i suppose, institutional) from a “here and now” perspective. However, I have two questions that arise when I read this. First: it is described in terms of results rather than attributes of the system that produces those results. That seems to have been the purpose of this (aspect of?) the discussion: how to identify a system that is digitally sustainable and one might do that by describing results. However, I wonder if the result attributes in your explanation are truly what distinguishes and digitally sustainable from a digitablly unsustainable system. Could it be possible to describe a fully closed and non-sustainable system within which lurks power innequeties and unfair advantages (in turn disrupting the possibility of a properly functioning society based on representing the people’s will and serving the people’s needs) that also creates those results? Sitting here thinking about for a few minutes, it seems that yes, indeed, I could create an entirely non-open system that produces all those same results as described. This is a typical strategy of proprietary technology advocates: define only in terms of final results that which open advocates say are the benefits and the meet them in a non-open fashion after there is agreement on the goalposts. Unfortunately, the benefits states are usually not the whole set of benefits of the whole story. They are usually the commonly intellectually accessible and immediate benefits, the sort often used to raise interest and demonstrate value in the open approach. Care should be taken not to set the goal posts in a way that describes a set of benefits from an open approach that can then be used to justify a non-open approach which in turn actually ends up working against the original goal, in this case digital sustainability. Second: it’s all about the now and the me. The transparency as described only talks about the world around me and my own opinions. Even if we assume that all people in society have equal access to this position, it neglects a tremendously important aspect of transparency: the future. If we can not peer into our own past, then we cease to be able to learn and build upon what others have learned before us. It is not possible to build new information by anyalyzing large sets of results built up over time. I know you know all that … but it seems the concept of future transparency for future citizens to understand the past world and how it led to the current world around them is lacking. This future transparency is critical to digital sustainability (imagine no Magna Carta, no historical record of our constitutions, of laws from past centuries, the authorship of and the debate the rose up around them!). It also happens to be unique to open approaches that this can be guaranteed in some form (as much as anything can be guaranteed). Participation is similarly “here” and “me”. I need to be able to participate in the management of data from the past as well, such as having the ability to verify votes in a past (recent or historical) election process. Self-determination is obviously about the “me”, and I appreciated your insight into how it is a ballancing attribute to transparency and participation, however it too is missing the temporal aspect, though for self-determination that may be more a detail issue than for transparency and participation. It’s truly great to see discussion happening in these areas and people reaching for broad new understandings on which to build society upon. I look forward to seeing more updates and following up through to the conclusions that get reached. Thanks for the thoughtful comments, Aaron, and thanks also for providing correct attribution for the quote! I agree that it is difficult to find concise definitions for complex matters that are sufficiently well-suited for the purpose. That discussion will still be ongoing for some time, I presume.